Hyphenation in Stanza – India, Ink. Okay! I’ve got basically one month left in which to do my thesis project, so I’m thinking I should try to blog about a little something every day, to force myself to process some of this stuff. Perhaps call it BroTheBloPoMo—Brooklyn Thesis Blog Post Month. What have I been up to? Well, unless you count reading a lot of trashy novels as e-books, not a whole hell of a lot. But, man, I am rocking the e-book–reading. You get the idea. These are from multiple books, but many of the nastiest breaks—ch-in, ch-est, again-st, the-se, on-ce, n-ever—appear over and over again. Stanza’s still my e-reader application of choice, but that’s mostly because it’s so easy to download my Fictionwise bookshelf into it. I’ve been buying my e-books almost exclusively from Fictionwise, so that’s key. Though they could be technological issues. 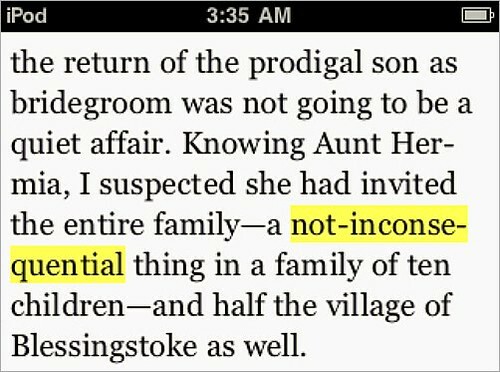 It would be great if the e-reading app had a built-in means of reporting typos to the publisher, so that they could be corrected for future downloads; or perhaps the reader could just correct the word in his or her own copy. 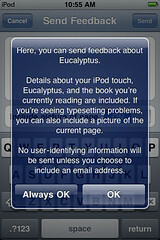 Clever Eucalyptus encourages users to send screenshots of bad typesetting, presumably so algorithms can be tweaked. 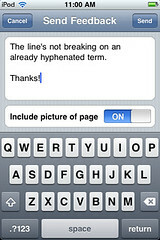 And if the front matter, ad card, and the like were marked as such, the e-reader software could then offer users choices such as “hide all front matter” or “display front matter at end of book.” I’d want a global setting, so all my books open to the first page of the main text and have any extraneous material glommed on at the very end. 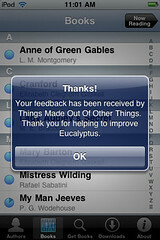 In terms of feedback, I think that’s a great idea. One do-able project: figure out a way to facilitate corrections on the fly for Project Gutenberg. Anyway, I think it would be possible to make such a system, and if you modify a reader that does this, I’ll read at least one book with it to test it out! Yes, I was just thinking this on my way to class today: it would be awesome to integrate something like Distributed Proofreaders into e-reader apps. Maybe there should be an open typo-reporting standard, and a central reporting place where the corrections get collated, and then publishers can track all their books by ISBN or something. The system could accommodate p-books as well as e-books. Hmm. Would have made a nice thesis project. Darnit.